IMAGINE BEING handed a gift--something life-changing, something you've hoped for and craved for years. Then imagine being told, not long after what you wanted was finally placed in your hands, that a mistake was made. The gift wasn't meant for you. You have to give it back. 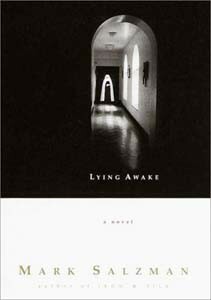 This, simply put, is the predicament that faces Sister John of the Cross--a long-cloistered modern-day Carmelite nun with a terrible choice to make--in author Mark Salzman's elegantly stunning short novel Lying Awake (Knopf; $21). The slim volume, weighing in at a brisk 187 pages, was released last year with little fanfare, but has since become a word-of-mouth phenomenon, hand-sold by independent booksellers around the country. In the Bay Area, the book found itself on The Chronicle's bestseller list for 20 remarkable weeks. Knopf representatives say that Salzman (Iron & Silk, Lost in Place, The Laughing Sutra, The Soloist) has become increasingly in demand as the book's fame spreads, receiving numerous requests each week for personal appearances. That such attention should come to a book so spare and so simple, a book as ambiguous as a Zen koan, is rather remarkable. But Lying Awake is a remarkable book. For 28 years, Sister John of the Cross--her nun's name borrowed from that of a Spanish poet and mystic--has been cloistered within the walls of small Carmelite monastery on the outskirts of Los Angeles. Despite her dedication to God, Sister John has not found them to be happy years. The first quarter of a century was spent in strict religious service, during which Sister John earnestly sought a sense of God's grace but was only rewarded, in Salzman's words, with "a heart squeezed dry." Just when she feels she can bear it no longer, Sister John's despair is shattered. She begins experiencing dazzling visions so powerful, so intense, they leave her physically wrecked but spiritually aflame. Here is how Salzman describes one of Sister John's visions: "Pure awareness stripped her of everything. She became an ember carried upward by the heat of an invisible flame. Higher and higher she rose, away from all she knew, Powerless to save herself, she drifted upward toward infinity until the vacuum sucked the feeble light out of her. . . . In this radiance, she could see forever, and everywhere she looked, she saw God's love." Radically transformed by these experiences, Sister John is suddenly seen as a spiritual master by the other nuns. She begins writing about her experiences, penning volumes of poetry and essays, one of which becomes a modest bestseller. But the headaches that accompany her visions grow worse, and Sister John is ordered to see a physician, who discovers a small tumor in the nun's brain. The tumor has been triggering epileptic seizures--the source of her visions, as well as her voluminous writing sprees. And it will kill her if it is not immediately removed. Will Sister John refuse the surgery, choosing death but retaining the soul-stirring visions? Or will she make an even more devastating choice: to save her life and return to the spiritual desert of those unbearable 25 years? Lying Awake, at its core, is a story of faith colliding with reason. But this is no cynical exercise in agnosticism. On the contrary, Salzman's book stands in awe of faith, and in Sister John of the Cross, that's a faith that is most luminous when it is tested to its limit. From the May 17-23, 2001 issue of the Northern California Bohemian.